Braised beef is known as “draadjesvlees” in the Netherlands. This literally means “thread meat”, referring to the flaky structure of the meat. Good draadjesvlees should be juicy and tender, not tough and dry. This means braising it over low heat for a long time. One of the most common cuts that is used for this “sucadelappen”, which in the US is called flat iron steak. The difference is that in the Netherlands the tendon is in the middle is left in and after long braising is eaten. The braised tendon looks like candied peel, which is “sucade” in Dutch. Hence the name. The dish I prepared can be made with or without sous-vide. With sous-vide cooking, a flat iron steak or other types of beef that are usually braised, can be cooked for 24-72 hours at 55-57ºC/131-135ºF to obtain the texture of a tender steak cooked to medium rare. 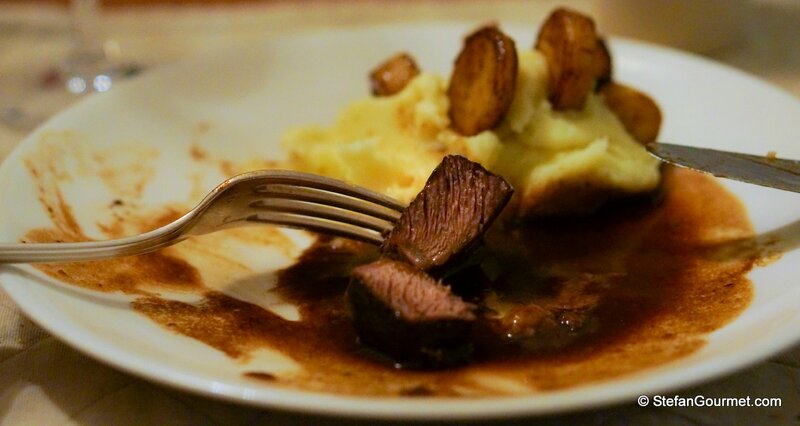 I’ve very rarely used sous-vide to get the texture of a traditional braise. Exceptions have been duck confit and pulled pork. This is the first time I’ve prepared draadjesvlees sous-vide. I cooked it for 5 hours at 88ºC/190ºF. The result was comparable to a good traditional braise on the stovetop. The advantage is that there is less margin of error.